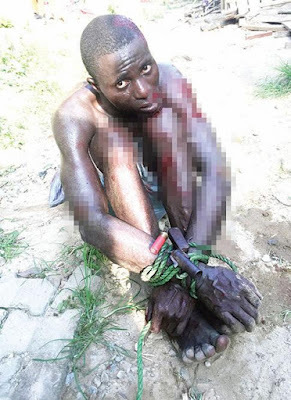 Some workers at Grace and Truth Tabernacle have reportedly disarmed a suspected robber, Samuel Ola, who allegedly invaded the church’s premises in the Magboro end of the Lagos-Ibadan Expresseway. It was gathered that 37-year-old Ola and his accomplice, identified simply as Aboy, had attempted robbing a motorcyclist when a mob gave them a chase. While escaping from the robbery scene, The Punch gathered that Ola reportedly scaled the fence into the church’s compound. A worker, Agbeni Bamidele, said he was inspecting a construction work on the premises when he saw the suspect acting suspiciously. The 55-year-old said when he interrogated him, he claimed to be a worker on the site. He said, “I saw him very close to the staircase that the labourers were casting. I asked who he was and he said he was an iron worker. I am into iron works and I know I kept only two people on the site before I left that morning, but I never doubted him. When I saw my brother, Sunday Ilesanmi, I asked how many of them were on the site, and he said three. Ilesanmi, an iron bender in the church, said he saw the suspect changing to a church member’s clothes when Bamidele told him (Ilesanmi) to verify his identity. The suspect, Ola, said harsh economic condition turned him to an armed robber, adding that he had stolen about 50 motorcycles. The Ogun State indigene said he ran into the church for safety. A security guard at the church, Peter Okwandu, had earlier apprehended the second suspect, Aboy.